The Large Hadron Collider has produced a great deal of incredible science, most famously the Higgs Boson — but physicists at CERN, the international organization behind the LHC, are already looking forward to the next model. And the proposed Future Circular Collider, at 100 kilometers or 62 miles around, would be quite an upgrade. The idea isn’t new; CERN has had people looking into it for years. But the conceptual design report issued today shows that all that consulting hasn’t been idle: there’s a relatively cohesive and practical plan — as practical as a particle collider can be — and a decent case for spending the $21 billion or so that would be needed. On the other hand, while the LHC has been a great success, it hasn’t exactly given physicists an unambiguous signpost as to what they should pursue next. The lack of new cosmic mysteries — for example, a truly anomalous result or mysterious gap where a particle is expected — has convinced some that they must simply turn up the heat, but others that bigger isn’t necessarily better. 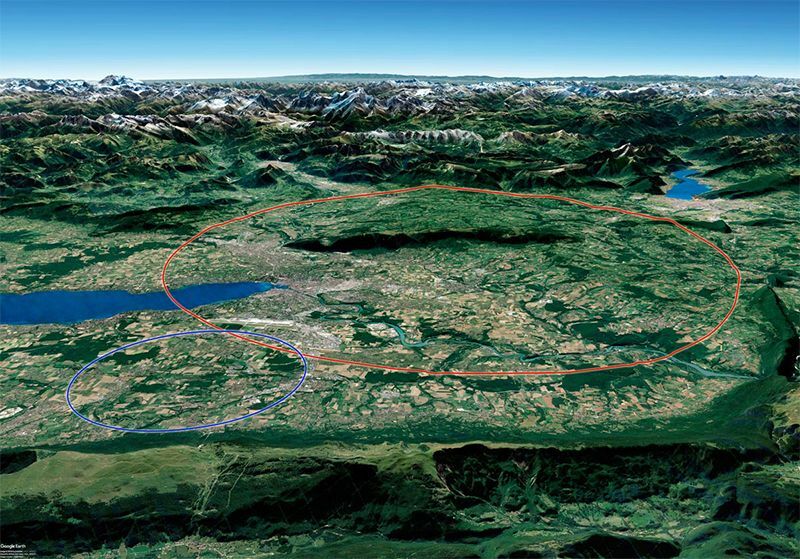 The design document provides several possible colliders, of which the 100-km ring is the largest and would produce the highest-energy collisions. Sure, you could smash protons together at 100,000 gigaelectron-volts rather than 16,000 — but what exactly will that help explain? We have left my areas of expertise, such as they are, well behind at this point, so I will not speculate, but the question at least is one being raised by those in the know. It’s worth noting that Chinese physicists are planning something similar, so there’s the aspect of international competition as well. How should that affect plans? Should we just ask China if we can use theirs? The academic world is much less affected by global strife and politics than, say, the tech world, but it’s still not ideal. There are plenty of options to consider and time is not of the essence; it would take a decade or more to get even the simplest and cheapest of these proposals up and running.